After a guest speaker visits her class at school, Anda joins the world of Coarsegold Online, a massively multiplayer role-playing game. She ends up spending most of her free time playing and for the naturally shy and quiet Anda, it’s a place she can be a take-charge leader and hero. And as Anda gains confidence in her skills as a gamer, it begins to show in other areas of her life. Through Coarsegold, she meets and makes friends with people from all over the world, but when she meets a gold farmer played by a poor Chinese teen, things get more complicated. She learns that the player’s activities – collecting valuable objects and selling them to players from more developed countries – may be illegal in the game, but it is how the other teen makes a living. Anda begins to realize what may be right and wrong inside the game may not always translate to things in real life as there are always other factors at play. 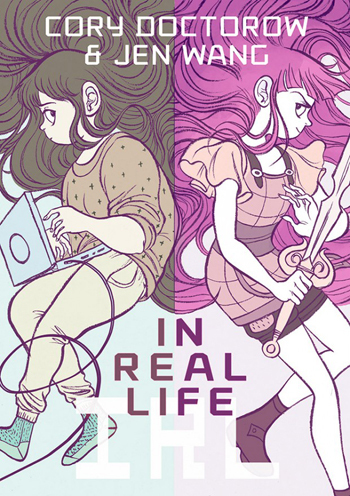 “In Real Life” addresses a number of topics, from girls in the gaming industry and economics to culture clashes and just being a teenager. With so much packed into one graphic novel, it would seem that the story could come off as preachy. And while there are such moments here and there, the pace of novel never slows down and the messages are expertly woven into the story, including the message that even teens can make a difference in their world. In addition to a great story, “In Real Life” has great illustrations by Jen Wang that really bring Anda and her world (both online and real) to life. The artwork is fresh and stylized and complements Doctorow’s story quite nicely. And while “In Real Life” focuses on girls in the gaming industry the story’s themes are universal, boys could enjoy the graphic novel as well. At the age of 18, Ethan Jones has been out of school for a few years. Living in a post-apocalyptic Australia more than 100 years in the future, he now works as a forager in the ruins of Melbourne, just outside his town of Newhome. He collects recyclable materials – mostly metal – to bring home. During one foraging trip out of town, Ethan and his team end up rescuing a Japanese councilor along with his translator, a teenaged girl named Nanako from Skels – scavengers wandering the world, attacking anyone who comes in their way. When Nanako arrives, she shatters the town’s rigid conventions – especially those regarding gender – such as the law that men are not allowed to be alone with an unmarried woman (even if she is a relative) and how all marriages are arranged by the couple’s fathers. With most books, movies, and other forms of entertainment portraying Asian cultures as the more rigid and strict societies, it was interesting to see the opposite in “Forager.” In Stone’s story, the Japanese town’s rules are looser when it comes to gender roles, allowing both males and females to serve in its law enforcement and allowing people to choose their own spouses. Whereas in Ethan’s town, girls and women are often not allowed out of the house without a chaperone and are not even allowed to eat their meals with men. 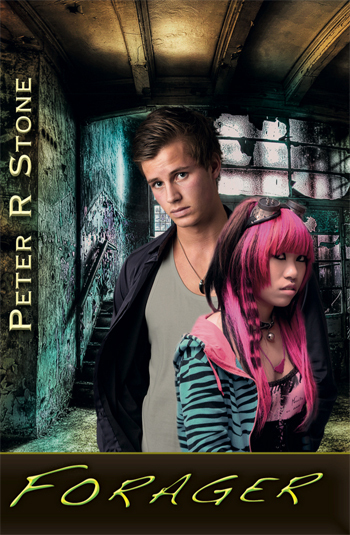 In another gender role reversal, the main character in this post-apocalyptic dystopian world, the main character is a teenaged boy, unlike many of the popular books in this genre in which the protagonist is female. As important as it is for girls to see that they can save the world, it is just as important for boys to see that they can do it as well. And while Ethan may be the protagonist in “Forager,” Stone shows strength in both genders and puts them on equal footing. For all of his life, Richard Aoki was never afraid to stand up for what he believed was right. Whether it was taking on a rival gang member or working to ensure equal rights, he rarely backed down from a fight. Born in 1938 in California’s Bay Area, Aoki spent his early years in an internment camp with his family during World War II. When they returned home after the war ended, Aoki’s family quickly fell apart. His parents separated; his father ran into troubles with the law; and he and his brother David spent a lot of time with the other teens in the neighborhood, eventually forming a street gang called the Saints. Because of the make up of West Oakland, where he grew up, many of Aoki’s friends were black. 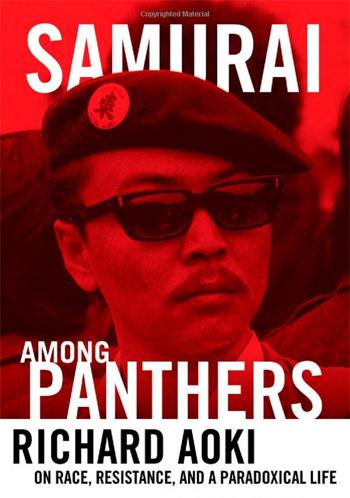 This established relationship with the black community eventually led Aoki, who died in 2009, to a friendship with Bobby Seale and Huey Newton, the founders of the Black Panther Party (BPP) in the 1960s. Aoki was the party’s most prominent non-black member, at one point, acting as a leader of one of the party’s local chapters. Alongside Aoki’s first-person narrative is Fujino’s interpretive history of the events that shaped the man. Aoki was a fascinating individual – always seeking to better himself and never hesitating to get his hands dirty to do the work. The fact that he was so easily accepted into the BPP shows how his beliefs and values regarding people’s rights were universal and applied to everyone.